The walk down the aisle isn’t long, but it’s one of the biggest moments of a person’s life. When you’re walking towards your future the last thing you want is to worry about your shoes slowing you down or hanging you up. Dr. Jeffery W. LaMour, a podiatrist and owner of the Family Foot & Ankle Clinic in Austin TX, is an expert on how footwear affects feet. “A pair of shoes may look great, but if they don’t fit great and provide adequate support they’re going to do nothing but detract from the big day,” says Dr. LaMour. Shoes, he adds, are just one part of the equation. Preparing your feet for the wedding is also an important part of the planning process that often gets overlooked. 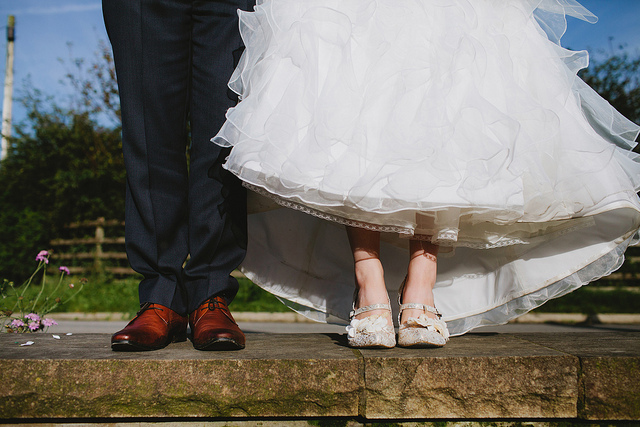 From walking down the aisle to the first dance as a newlywed, your feet play an integral part in the wedding. Before the big day Dr. LaMour suggests adding foot care to your to-do list. Your pre-wedding schedule is full of meetings with event planners, caterers, venue managers and even aestheticians, but rarely do people in the wedding party plan a visit to the podiatrist. “It’s a good idea for anyone, but if a person has suffered a foot or ankle injury in the past then checking up with a podiatrist should be high on the to-do list,” says Dr. LaMour. If a wedding party member is currently experiencing any issues south of the knees a trip to the foot doctor is an absolute must. A podiatrist can examine the overall health of your feet, provide advice on how to properly care for your lowest appendages, fit you for insoles or pads, treat problems like a fungal infection and note problems to watch out for so that you avoid a potential injury. Expect the doctor to ask a lot of questions, study how you walk and stand and possibly run tests if there are any medical issues. 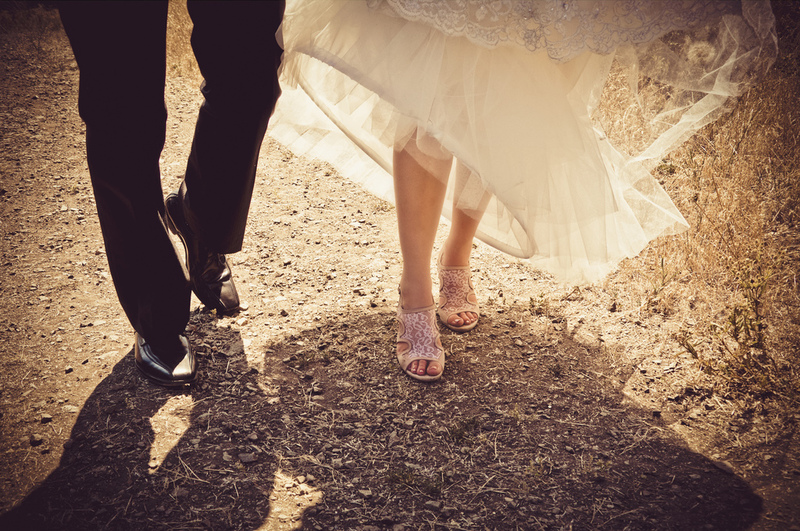 It can take up to several months for fungal medications to work and custom insoles to be created, which is why planning a visit to the podiatrist office should be scheduled at least 3-6 months before the wedding day. If you aren’t able to get in to see a podiatrist in advance it’s important to choose a doctor that uses advanced equipment for a quicker fix. Dr. LaMour is one of the numerous podiatrists that have invested in laser technology. Machines like the PinPointe FootLaser can get rid of foot fungus immediately if a patient is under a time crunch. The best practice will replicate the event as closely as possible. Practice your walk in the shoes you plan to wear, a veil if you plan to have one and holding something as a stand in for the bouquet. Keep the “bouquet” close to your body and positioned slightly below the waist. On a regular day people rarely pay close attention to their body movements when they walk. But when you’re practicing your walk down the aisle you should focus on each step so that you slow the pace down and maintain perfect posture. This practice needs to happen in a location similar to where the ceremony will take place. Practicing in your home won’t prepare you for an aisle walk that’s outdoors on the grass or on a sandy beach. Once you have your wedding attire practice walking when you’re completely done up. Do it over and over until you feel completely comfortable. De-stressing is important for your overall health and handling the hectic pre-wedding schedule. Giving feet a good massage can help to relieve stress and its symptoms, but visiting a podiatrist is typically more effective. “A specialist can determine if there are any underlying health issues, and they can show you stretches and exercises that reduce stress as well as the related symptoms you’re experiencing,” explains Dr. LaMour. A doctor can also help patients create a long-term stress-reducing plan that can be used after the wedding. Pedicures have become standard procedure for brides, mothers and bridesmaids. This is especially true in a warm city like Austin, TX where Dr. LaMour runs his practice. Unfortunately, in an attempt to beautify feet may women inadvertently subject them to harmful bacteria and fungus. In 2010 the Food and Drug Administration found that toenail fungus is a common occurrence that affects approximately 35 million people at some point in their life. Fungus can work its way in anytime there is a small cut or separation between the nail and skin. One place where fungus and bacteria can be spread is the spa. Steps have been taken to prevent this, but the practices of the technician and spa largely determine the likelihood of a skin infection after a pedicure. Put off the appointment if you have a cut, bug bite or open wound on your feet, ankles or shins. Also, refrain from shaving or waxing at least 24 hours before the appointment. Check to make sure the technician is properly licensed with the state. Over the last decade there has been a lot of discussion about regulations in the industry to help prevent injury and disease. Feet should be soaked in warm, not scalding, water for no more than 15-20 minutes. The foot basin should also be fresh and clean before being used. Ask the technician what steps they take to clean the basins. The process should include cleaning the filters, screens and tubes. New loofas or pumice stones should be used to buff the dry, dead skin from feet. Feet should be completely dried – fungus needs moisture to grow. The tools used need to be 100% clean. If the technician just used them on someone else don’t allow them to be used again until they are thoroughly cleaned. The best way to assure that fungus, bacteria and disease doesn’t get spread to your feet is to purchase a set of tools and bring them with you for the technician to use. If feet are dry and cracked for long periods of time it may be a problem that can’t be fixed with a simple pedicure. Dry, cracked feet can be a symptom of another health issue such as thyroid disease or diabetes. If left untreated cracked skin can also lead to a painful fissure or infection. If you moisturize regularly or have gotten pedicure but still experience severely dry skin schedule a podiatrist visit before your wedding to address the issue. After months of planning, picking out the perfect shoes, practicing the walk down the aisle and taking care of your feet the wedding day has arrived. Now is the time to put all the podiatry preparations to good use. “Don’t let all the attention distract you or stress you out while you’re walking down the aisle or enjoying yourself at the reception. These nerves will transfer right to the feet causing uncomfortable anxiety symptoms and making it more difficult to walk,” says Dr. LaMour. Use a foot powder to keep sweat in check. Feet sweat all the time but when stress, nerves and activity are involved the possibility of getting sweaty feet goes way up. Take regular breaks where you can get off your feet. This will help prevent fatigue and provide much-needed recovery time. If possible opt for closed toe shoes that aren’t constrictive. Bring a comfortable pair of shoes for the reception. Once the ceremony is over and the pictures have been taken you can kick off the formal footwear and slip into a pair of flats that have good cushion and support. Not only will it be more comfortable, but stepping out of heels will also help brides conserve more energy, stress muscles less and prevent possible injuries. There may be a lot going on before the wedding, but taking care of the feet that will walk you down the aisle is a top priority that’s easy to overlook. Take the steps to prevent problems before they happen and you’ll be that much more happy and relaxed on your wedding.